Salt (NaCl – sodium chloride), is a natural mineral called halite that is present in many parts of the world. Common salt, or sodium chloride, is made up of white cube-shaped crystals, chemically compounded of two elements, sodium and chlorine. Salt occurs naturally in underground salt deposits in bedded sedimentary layers and domal deposits. Domal deposits are massive underground salt deposits built up over tens of thousands years by evaporated saltwater from former marine basins. Bedded salt occurs as sedimentary layers of salt and other minerals such as sodium, potassium, phosphorus, iron, zinc and calcium. Salt also occurs as a dissolved solution in seawater in the oceans and in salt lakes. Most of the world’s salt is harvested from underground from salt mines, or by evaporating sea water. Salt is used for various purposes, the most common in food industry to add flavor to foods. Salt is also used as a food preservative, due to the anti-bacterial and anti-fungal properties of salt. However, not all salt is created equal or the same; there are many types of salt to choose from – Grey Rock Salt, Himalayan Pink Salt, Kosher Salt, Sea Salt, Celtic Salt… and plain refined table salt. In this article we will group them and analyse from the SaltAir – Home Salt Therapy perspective. Refined salt, or table salt, is the most commonly used type of salt. It is usually highly processed by grounding and removing most of the impurities and trace minerals. Being finely grounded it will clump together and for this reason various substances called anti-caking agents are added to help flowing freely. Due to these characteristics it is not recommended to be used in salt therapy. Sea salt is made by evaporating seawater from seas, oceans, salt lakes or other mineral-rich waters. Like table salt, it is mostly just sodium chloride. However, depending from where it was harvested and how it was processed, it usually does contain trace of minerals like potassium, iron and zinc. It can also contain trace amounts of heavy metals like lead or other pollutants, due to today’s high pollution of oceans. The darker the sea salt, the higher concentration of impurities and trace minerals. There is a huge market promoting the use of sea salt but as you can see, it is far from the best. We do not recommend the use of sea salt for salt therapy in breathing problems! Rock salt or Halite as a mineral, typically occurs as colorless isometric crystals, but can also be light blue, dark blue, purple, pink, orange or gray depending on the amount and type of mineral impurities. Rock salt (halite) usually formed in Middle Miocene Epoch when there was a time of warmer global climates and the salt was left behind by the primordial oceans; salt deposits built up over tens of thousands years by evaporated saltwater in marine basins or sedimentary layers. These salt layers were covered by rock formations, so they are located underground or inside mountains. Salt can also be found on the surface in desert regions. Rock salt is extracted from underground using two procedures – evaporated brine (concentrated salt solution) and mining. In the process of evaporated brine, water is ‘injected’ into the rock salt layers, deep underground, and the concentrated salt solution flows through pipelines in a collection tank and undergo the re-crystallisation process in the evaporator plant. Through this method many natural minerals are washed out and lost. In the process of mining, rock salt is extracted from rock layers with the help of mining methods. Most salt mines operate underground, but there are open-cast mines where rock salt is mined on the surface. This type of salt is the best salt because it preserves all its natural properties being very little processed during mining. After extraction it is mostly crushed and sieved for particle size distribution. Rock salt is the only salt recommended in halotherapy (salt therapy) for breathing problems, being the most natural type of salt. Sodium chloride together with the natural occurring minerals in rock salt have a synergetic effect on respiratory mucosa, allowing great health results in salt therapy. SaltAir – Home Salt Therapy device by Halosense uses grey rock salt as in most halotherapy medical studies. 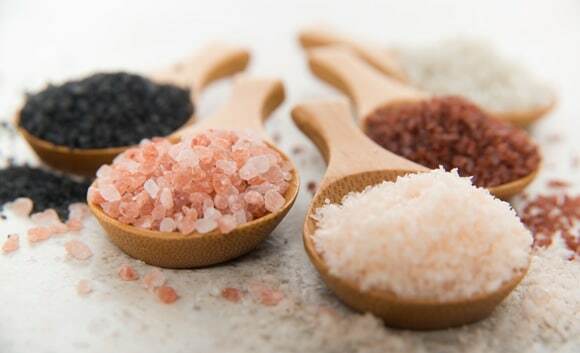 Other types of salt, such as Himalayan rock salt has a higher content of iron oxide (rust) which gives it the pinkish color and it is not suitable for use with the ultrasonic devices in salt therapy, but looks very nice in salt lamps and also very good in cooking.